While most of the team headed up to River Gorge for the BMW Omnium, I headed over to Atlanta, Georgia to try to retake the lead in the Georgia Cycling Gran Prix series. Alas, I fought hard, but it wasn’t to be. Still with another podium finish in yesterday’s road race, I am happy to have finished 2nd place overall for the 11 weekend race series. Today’s circuit race was canceled because of a nasty thunderstorm with lots of cloud-to-ground lightning. Even though I wasn’t quite able to win the series, I was very happy with how it was organized and how it gave me and our team a goal for something to fight for all season long! Here’s a picture that Kristine got of the podium yesterday. 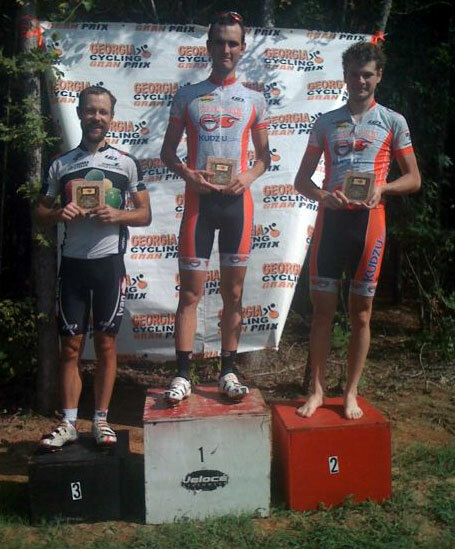 This entry was posted in Racing and tagged heartrate, photo, podium on August 30, 2009 by kartoone. Way to fight to the finish! I’ve enjoyed cheering you on to lots of podiums this season! Woohoo!